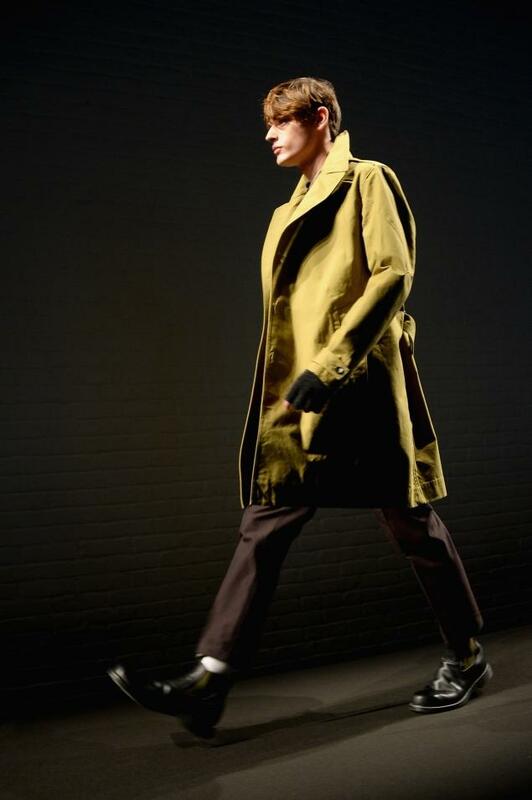 As snow at last changes to rain, mighty winter wool gives way to the streamlined trench coat. The top two come from Burberry’s London collection for Spring 2014. 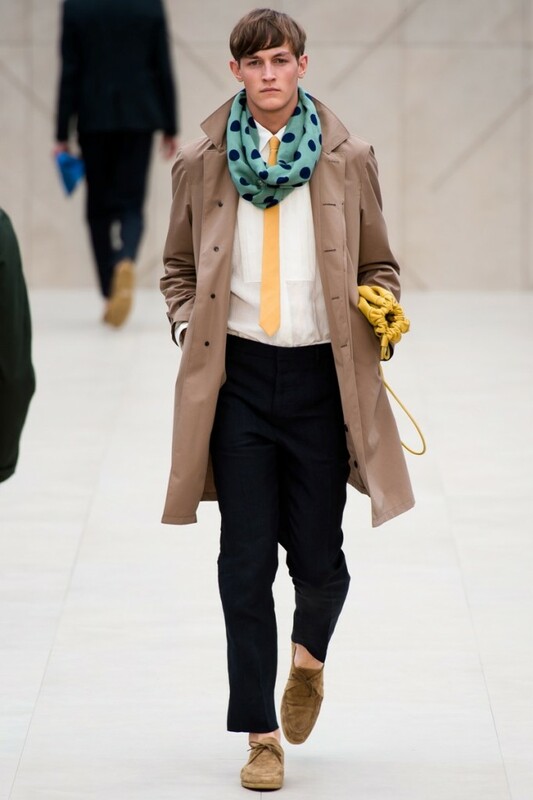 The chartreuse trench below is from last week’s NYFW collection by Rag & Bone for Fall 2014, but I find plenty of spring inspiration in it. 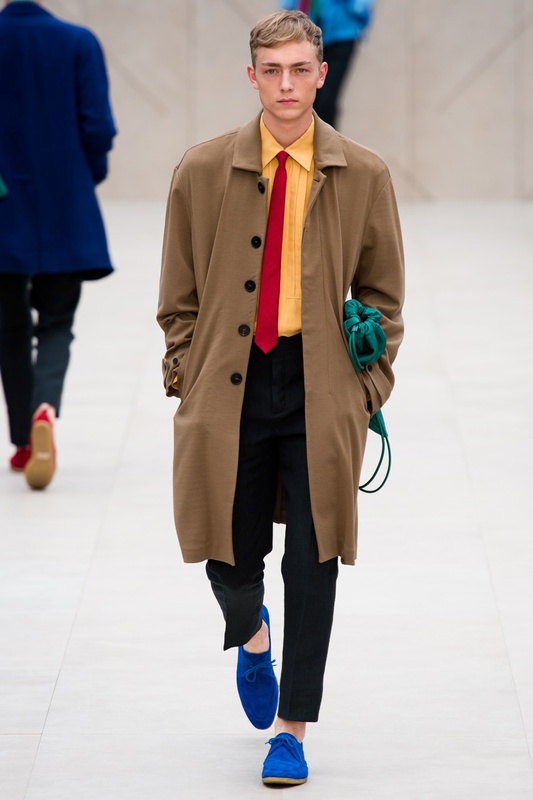 When you want to spread your wardrobe dollar around more than investing in a designer piece like these allows, the trench coat is a solid vintage option. Its classic design hasn’t changed all that much, so decades-old examples can be just as in style today. Going vintage can mean finding many fetching variations in colors, fabrics and features that give yours a sartorial edge. Since overcoats often command a hefty investment, the savings can be equally significant. 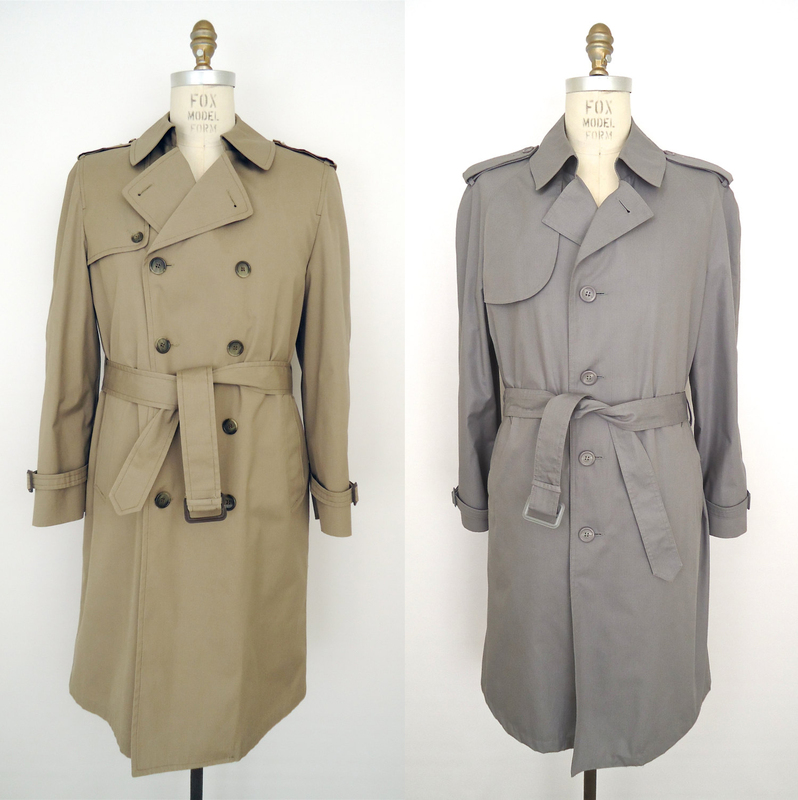 As tastes in clothing, and especially work wear, have evolved, the trench coat is not the staple of every man’s wardrobe it once was, though it is a piece those men held onto and took care of. All which means there are many readily available on the vintage market today. 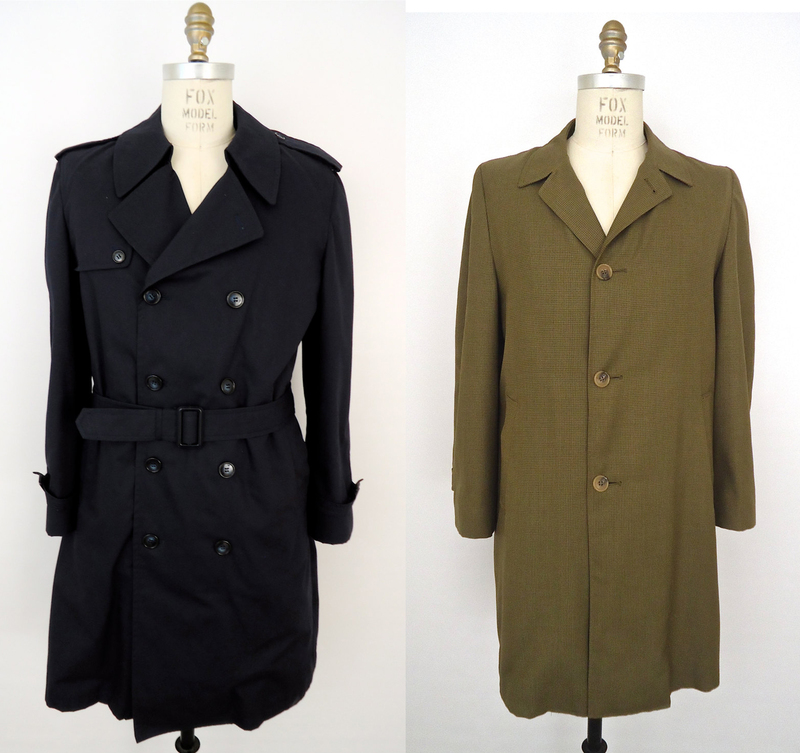 The middle two pairs of trench coats are listed in the shop now, and plenty others like them have passed through in the past year or so. 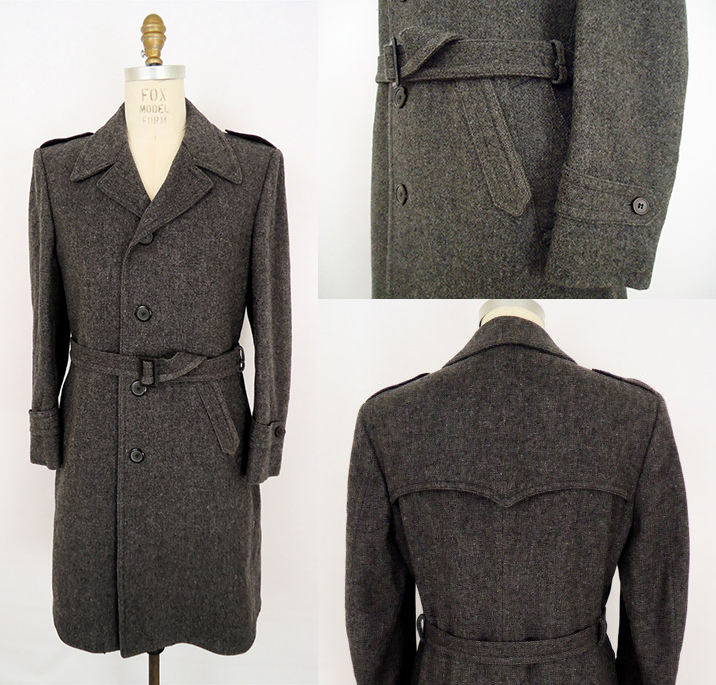 Below the photos of paired trenches are details of past shop listings like the gray wool trench, Burberry plaid lining, and familiar double breasted front. The classic trench design is taken from military uniforms and consists of a belted, 8×4 or 10×5 double breasted front, Ulster collar, raglan sleeves with shoulder straps and belted cuffs, storm flap, khaki cotton blend shell and removable insulated lining. As even the few photos above indicate, the trench has evolved to be worn with or without any combination of these features and in as many colors and fabrics as the army of men who still favor them.